Chief Justice Roberts was confirmed today on a 78-22 vote in the Senate. 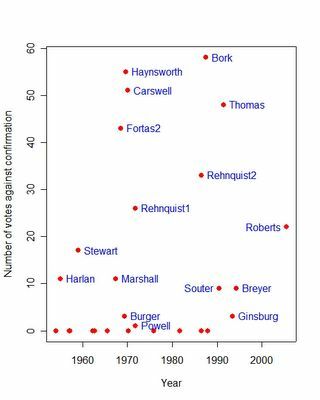 Coincidentally, this vote margin resembles the votes on the man he replaces, the late Chief Justice Rehnquist. Rehnquist was initially confirmed as an Associate Justice by a 68-26 vote in 1971. His elevation to Chief Justice in 1986 drew more opposition, 65-33. In the Roberts case, confirmation was assured by the united Republican majority despite pressure from Democratic interest groups which urged "nay" votes from Senators of their party. In the end, 22 of the 44 Democrats voted against the Roberts nomination. The bad news: Katrina is the GOOD news. Overall Job Approval, updated to 9/18.